There will be a new bible arriving in stores soon, and gracing it’s pages will be an interesting cast of co-stars: Angelina Jolie, Bono, Martin Luther King Jr., even Ghandi. 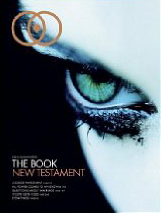 A Swedish author has compiled the new, Bible Illuminated, unique interpretation of the New Testament. [Publisher Illuminated World is] hoping for similar success in the U.S. and plan to release the New Testament in October and potentially the Old Testament in March. In the U.S., the New Testament is already pre-selling on Amazon and Illuminated World has contracts with most major bookstores. The book is already making waves in the publishing world, but does the public think about it? Elizabeth Eisenstadt Evans, of the blog Get Religion, questions the intent of the consumer. At the end of the [Associated Press’ article], I didn’t know how this new edition is being evaluated by scholars, or pastors, or even readers. Is it being seen as a new tool for evangelism, or simply a cool living room table accessory? The legacy of this, and other new pictorial bibles, is worth considering, along with the publisher’s intent. Larry Norton, of Illuminated World, is banking on a new secular market developing an appreciation for his bible. “There is a large part of the population that considers themselves smart, educated, conscientious, connected people who are not particularly religious and have not regularly read the Bible,” said Larry Norton, a former publishing executive and president of Illuminated World, the company that is putting out “Bible Illuminated.” “That group of people probably know it would be smarter, more sensitive to their surroundings if they read the Bible if they were religious or not,” Norton said.